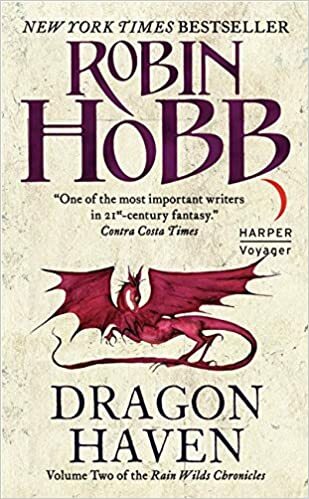 This latest round of interesting words comes from Robin Hobb's Dragon Haven. bawd: A woman who keeps a brothel; a madam. indolent: Disinclined to exert oneself; habitually lazy. lunker: Something, especially a game fish, that is large for its kind. treacle: Cloying speech or sentiment. This latest round of interesting words comes from Richard Kadrey's Sandman Slim. alembic: An apparatus consisting of two vessels connected by a tube, formerly used for distilling liquids. doubloon: A gold coin formerly used in Spain and Spanish America. drachma: An ancient Greek silver coin. gendarme: Originally, in France, a man-at-arms; a knight or cavalier armed at all points and commanding a troop; afterward, a member of a company or corps of cavalry; a cavalryman: sometimes also used for soldier in general. mugwort: Any of several aromatic plants of the genus Artemisia, especially A. vulgaris,native to Eurasia and sometimes used as a condiment. orrery: A mechanical model of the solar system. ossuary: A container or receptacle, such as an urn or a vault, for holding the bones of the dead. zoetrope: An optical toy, in which figures made to revolve on the inside of a cylinder, and viewed through slits in its circumference, appear like a single figure passing through a series of natural motions as if animated or mechanically moved. 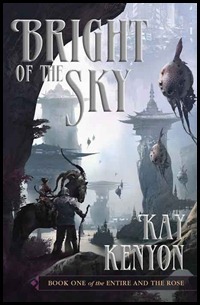 This latest round of interesting words comes from Kay Kenyon's Bright of the Sky. alkaloid: Any of various organic compounds normally with basic chemical properties and usually containing at least one nitrogen atom in a heterocyclic ring, occurring chiefly in many vascular plants and some fungi. archon: A high official; a ruler. cyanogenic: Capable of producing cyanide. demiurge: A powerful creative force or personality. epicanthic: Of or pertaining to an epicanthis; growing in or upon a canthus or corner of the eye. espalier: A tree or shrub that is trained to grow in a flat plane against a wall, often in a symmetrical pattern. glycoside: Any of a group of organic compounds, occurring abundantly in plants, that yield a sugar and one or more nonsugar substances on hydrolysis. gulag: A forced labor camp or prison, especially for political dissidents. harangue: A long pompous speech, especially one delivered before a gathering. legate: A person commissioned to represent a state, or the highest authority in the state, in a foreign state or court; a deputy; an ambassador. meritocracy: A system in which advancement is based on individual ability or achievement. phenolic: Any of various synthetic thermosetting resins, obtained by the reaction of phenols with simple aldehydes and used to make molded products and as coatings and adhesives. tannin: Any of various chemically different substances capable of promoting tanning. terpenoid: A very large class of naturally occurring and synthetic organic compounds formally derived from the hydrocarbon isoprene; they include many volatile compounds used in perfume and food flavours, turpentine, the steroids, the carotene pigments and rubber. toadyism: The practice of meanly fawning on another; base sycophancy; servile adulation. unctuous: Containing or composed of oil or fat. 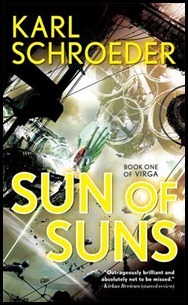 This latest round of interesting words comes from Karl Schroeder's Sun of Suns. armature: The rotating part of a dynamo, consisting essentially of copper wire wound around an iron core. boatswain: A warrant officer or petty officer in charge of a ship's rigging, anchors, cables, and deck crew. contrail: A visible trail of streaks of condensed water vapor or ice crystals sometimes forming in the wake of an aircraft. Also called vapor trail. diatom: Any of various microscopic one-celled or colonial algae of the class Bacillariophyceae, having cell walls of silica consisting of two interlocking symmetrical valves. gelid: Cold; very cold; icy. ingenue: An innocent, unsophisticated, naïve, wholesome girl or young woman. insouciant: Marked by blithe unconcern; nonchalant. mendicant: Depending on alms for a living; practicing begging. minaret: A tall slender tower attached to a mosque, having one or more projecting balconies from which a muezzin summons the people to prayer. pearlescent: Having a pearly luster or gloss. peridot: A yellowish-green variety of olivine used as a gem. pipette: A narrow, usually calibrated glass tube into which small amounts of liquid are suctioned for transfer or measurement. prodigious: Impressively great in size, force, or extent; enormous. prosaic: Consisting or characteristic of prose. quiescent: Being quiet, still, or at rest; inactive. sargasso: (gulfweed) Any of several brownish seaweeds of the genus Sargassum of tropical Atlantic waters, having rounded air bladders and often forming dense, floating masses. These interesting words were found in Peter V. Brett's The Warded Man. poultice: A soft moist mass of bread, meal, clay, or other adhesive substance, usually heated, spread on cloth, and applied to warm, moisten, or stimulate an aching or inflamed part of the body. tincture: A coloring or dyeing substance; a pigment. vassalage: The condition of being a vassal.